In the mid 1800s, Ecuador, a South American country, was shipping its exportable wares, including straw hats, to the Isthmus of Panama. The hats were picked up by gold seekers crossing the isthmus overland as they rushed to and from California. 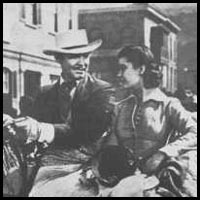 Clark Gable wore a classic Monte Carlo style panama straw hat in the 1939 movie depicting the Civil War years, Gone with the Wind. A wide variety of natural and synthetic materials are used to make straw hats which give maximum comfort and pleasing style. Some of the better known soft straws are Open-weave Panama, New braids, Hanoki, Hemp, Peanit, Leghorn, Baku, Bangkok, and Madagascar. Panama straws are body hats made of toquilla fiber, which is woven in Ecuador, Colombia and Peru. Quality depends on fineness and evenness of fiber and weave, cleanliness of fiber and firmness of brim edge. The finest Panamas are woven in Monticristi, Ecuador. New braids are too many to enumerate. Originally most all came from the Orient. Today, an increasing number of new and sturdy weaves are coming from South American and the West Indies. Some are coming from Ecuador, and made of the Panama toquilla fiber, some from the coconut palms of the Bahamas, some from the Virgin Islands, and many from other tropical countries. Most have fine natural color, others are dyed in desired shades. Hanoki is a lightweight, open-weave body straw hat, made of a Chinese wood fiber twisted into fine, ropelike strands, and woven. It is offered under a variety of trade names, can be blocked in a variety of felt hat shapes, and has a fine, mellow color. Hemp material is light and resilient, and originates in Manila. It is machine-woven into open-weave, porous bodies. Close to 600 strands, each consisting of two or three twisted fibers, go into the finished hat. The Sisol Hemp is hand-woven in the interior of China, using Manila hemp. The Split-Peanit is a body straw hat, hand-woven of split fibers obtained from leaves of the pandan tree, a palmata-like shrub that grows in Java. It is porous, light in weight, made of a strong, durable fiber and moderately priced. Leghorn is a featherweight, open-weave hat made of specially cultured and woven wheat fiber, shipped from the port of Leghorn, whence it gets its name. The finer, upper portion of the the wheat stalk is plaited into Leghorn braid. This straw hat is light, durable, clear and bright in color. Baku is a body straw hat made of Philippine fiber which is exported to China, and woven by Chinese experts. It is an extremely lightweight, porous, fine-woven hat, having the appearance of a fine mesh screen. In better weaves, it is also called Shantung. Bangkok is another straw body hat made in the Philippine Islands. The fiber is obtained by stripping strands of the Buri Palm leaf into straws. The Buri Palm also supplies the fiber for Balibuntal hats. Balibuntal fiber is extracted from the stem and mid-rib of the leaf. Madagascar is one of the lightest straw hats made, and is produced from a porous, water-resistant cloth made of split palm leaves, on the Island of Madagascar. Cloth is cut and sewed in various hat shapes. Although the above constitute the better-known straws, there are many more.